Carol Allan lives in Galloway where she enjoys the scenic views and observing the local wildlife and the dark skies at night. Hobbies include photography, with red squirrels being favourite subjects. Genealogy is another great pastime. 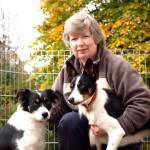 Her two young Border Collies keep her active and there is never a dull moment, as they are very inventive and love to get into mischief if not given tasks to occupy them. She has been a Chalet School enthusiast since the age of eight, when she was given eight early editions of the Austrian books. We have very few copies of Gillian of the Chalet School left in stock.